/ virus pictures / influenza pictures (influenza A): Birds & Bird Flu graphics showing avian influenza (H5N1) mixing with other 'flu strains; image of bird flu viruses and human flu viruses entering the same cell and pandemic influenza emerging, diagram of replication of viruses showing reassortment of viral RNA genome segments (genetic mixing or recombination) creating a new viral strain (reassortant) with the potential to create a catastrophic new flu pandemic against which no flu vaccine will protect. 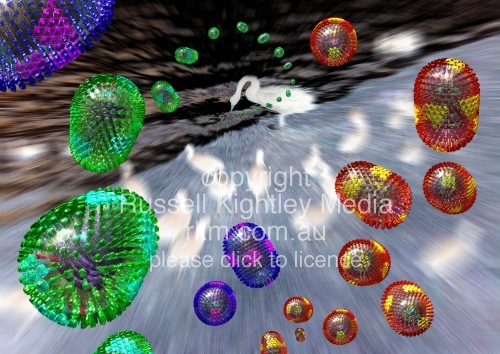 BIRD FLU & HUMAN FLU REPLICATION IN A SINGLE CELL: graphic artwork (above) showing avian influenza viruses (H5N1 shown in green) emerging from birds and infecting a cell. A human strain (shown in blue) infects the same cell. The genome segments (green and blue dashes) enter the nucleus (purple curved surface) and are copied. The new copies exit the nucleus but get jumbled together and form the genome of a new viral strain (red-yellow virions) that might be as lethal as the bird flu and as easily spread from person to person as the human flu. This seems to be the recipe for the next influenza pandemic. Above image measures 500 pixels across but the original image is 4000 x 5657 pixels. 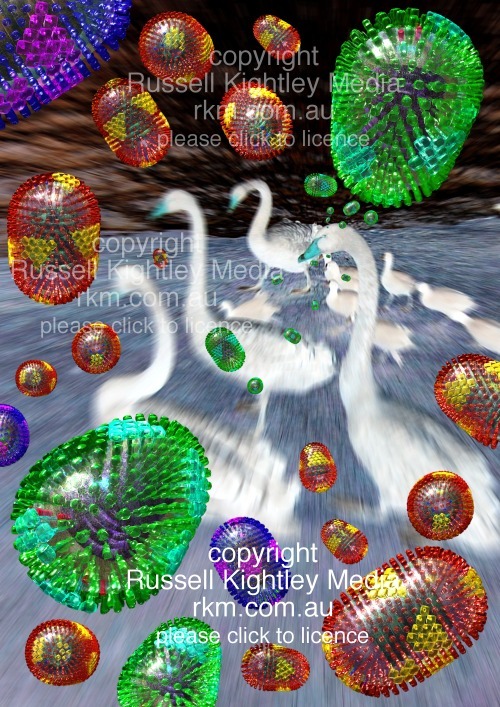 BIRDS & BIRD FLU GRAPHIC #1: artwork (above) showing avian influenza viruses (H5N1) emerging from birds and mixing with other strains of influenza virus. Above image measures 500 pixels across but the original image is 4000 x 5657 pixels. BIRDS & BIRD FLU GRAPHIC #2: artwork (above) showing avian influenza viruses (H5N1 - shown in green) emerging from birds (swans) and mixing with other strains (blue) of influenza virus, creating the potential for a new strain (red & yellow) which can pass easily from person to person, thereby creating the potential for a pandemic. Above image measures 500 pixels across but the original image is 4000 x 5657 pixels. BIRDS & BIRD FLU GRAPHIC #3: artwork (above) showing avian influenza viruses (H5N1 - shown in green) emerging from birds and mixing with other strains (blue) of influenza virus, creating the potential for a new strain (red & yellow) which can pass easily from person to person, thereby creating the potential for a pandemic. Above image measures 500 pixels across but the original image is 5657 x 4000 pixels. PANDEMIC FLU GRAPHIC ON WHITE: Above image measures 500 pixels across but the original image is 4000 x 5657 pixels and contains no text. The design allows text and labels to be easily inserted so that you can customise the graphic for your needs. BIRD FLU VACCINE: considerable effort is being devoted to create large quantities of influenza vaccine to fight a potential bird flu pandemic. Vaccines rely on the immune system to fight the disease. A vaccine primes the immune system by exposing the body to antigens present on the infecting agent. Influenza vaccines have to be regularly updated because the influenza virus constantly changes its surface antigens. The flu virus is a moving target, antigenically speaking, and so vaccine manufacture lags viral innovation. The problem with vaccinating against a flu pandemic is that we do not know what the new pandemic influenza strain will be like. Avian influenza vaccines might not work against a novel pandemic viral strain. A vaccination program will require a huge investment of resources. There is a race on to develop vaccines very fast and one option is DNA vaccines. DNA vaccination works by introducing DNA that codes for the antigen. The host cells create copies of the antigen which provoke an immune response thereby priming the person's immune system against a future attack by the real pathogen. 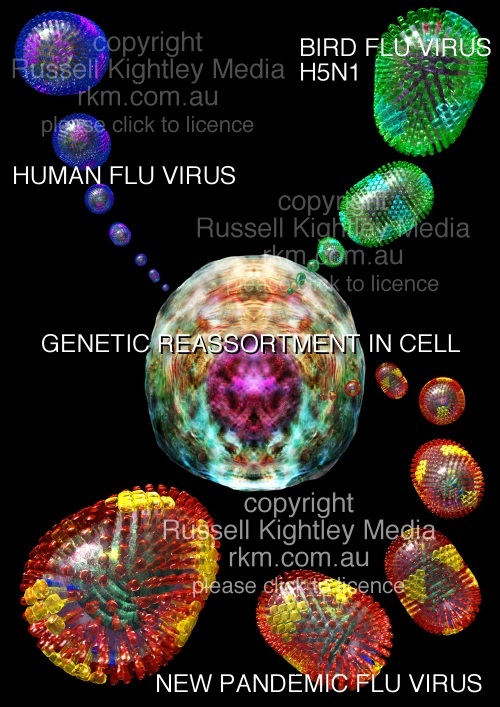 FLU FLU REASSORTMENT GRAPHIC: illustration above shows reassortment of viral RNA segments in a cell infected by two strains of influenza virus (e.g. human and bird flu) leading to a new and potentially dangerous strain that could spread easily from human to human and so trigger a deadly worldwide epidemic. Such genetic mixing might occur in pigs, since a pig might be infected by both strains and then pass the new virus on to humans. Above image measures 500 pixels across, original image is 4744 pixels across. Influenza A virus has its RNA genome (genetic material) split into 8 segments. If two different viral types infect the same cell, then segments from both types can get jumbled together (they reassort) as the new virus particles are assembled. Consequently, new viral strains can emerge that contain a mixture of the parental genes. Image shows two different viral strains (BLUE genome at upper right and ORANGE genome at upper middle) infecting the same cell (at lower right). During replication, new viral particles may emerge that contain segments sourced form both the BLUE and the ORANGE strains. The new strain (BLUE & ORANGE STRIPED genome, shown at left) has the potential to spread rapidly. 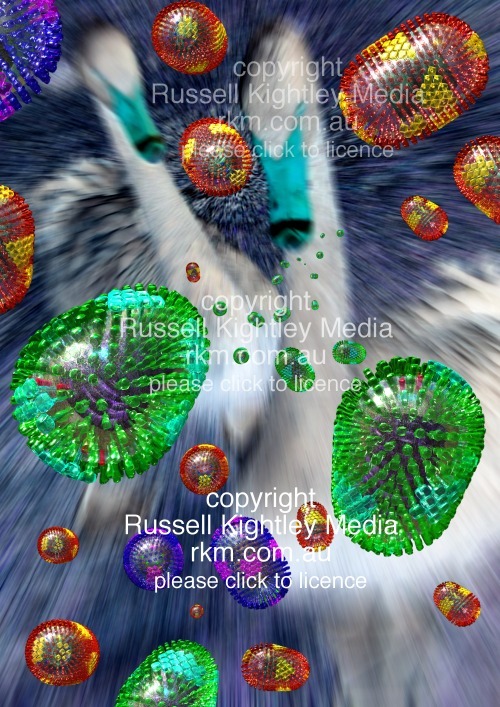 CELL ENTRY: At upper right, a BLUE influenza virus particle (representing an avian flu virus) is shown landing on the cell surface. The virus docks with cell membrane when the red spikes (haemagglutinin, shown in red) link to molecules on the cell surface. The cell surface folds inwards causing the virus particle to sink into the cell. The virus sinks deeper into the cell until it is completely wrapped up in cell membrane. The resulting membranous "bubble" (or vesicle) breaks free from the surface of the cell and transports its contained virus into the cell. The netlike structure beneath the docking virus and the cage-like structure around the resultant vesicle represent clathrin, a protein that forms an external scaffold that causes the cell membrane to invaginate and finally form the vesicle (this entry mechanism is called receptor mediated endocytosis please see our VIRAL ENTRY graphic). 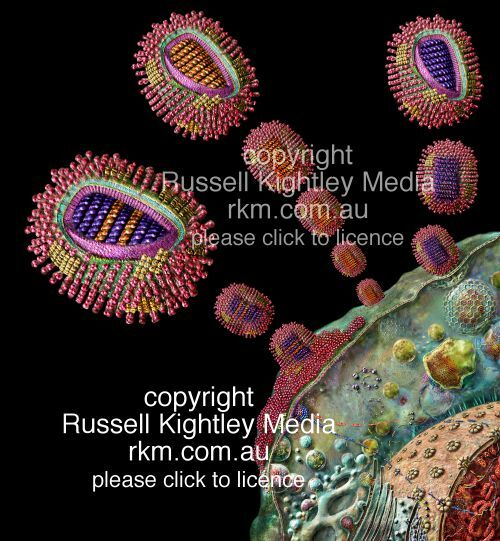 Further to the left an ORANGE influenza virus particle (representing a human flu virus) is shown landing on the cell surface. UNCOATING OF VIRUS AND RELEASE OF GENOME INTO CELL: The clathrin coat is then lost and the virus in its naked vesicle can be seen half out of frame at the right of the image. The engulfed virus then appears in an endosome (the large irregular yellow vesicle). It is more acidic in the endosome and this modifies the haemagglutinin spikes. 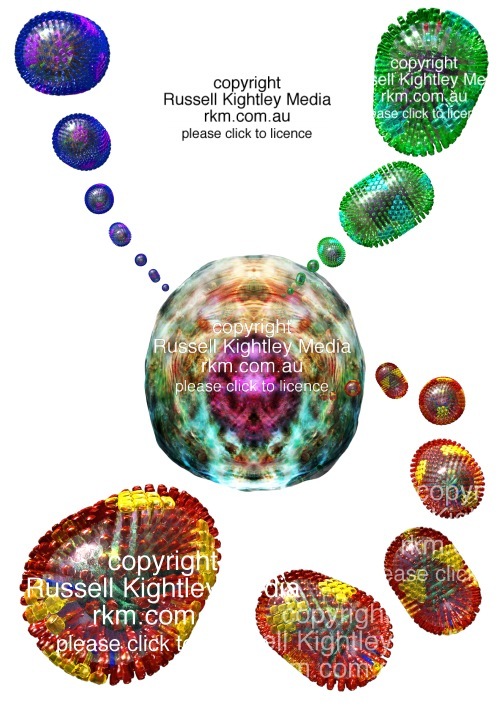 The altered haemagglutinin draws the membranes of the virus and endosome together and they merge, creating a hole through which the viral contents are poured into the cytoplasm. These contents include the viral matrix protein (purple) and the nucleocapsid (BLUE segments). 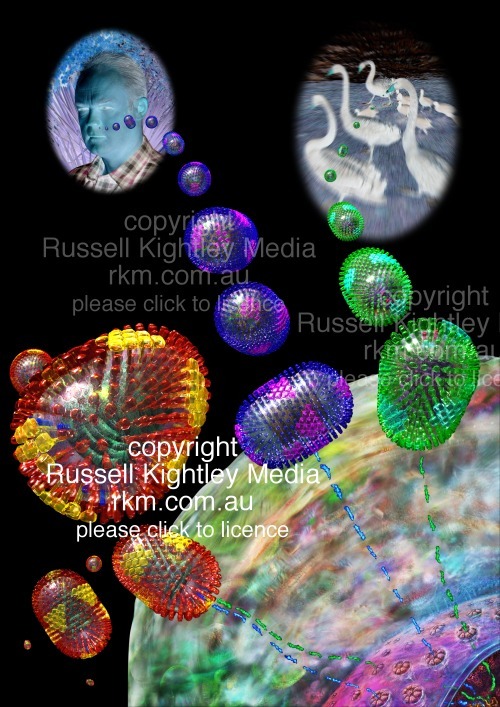 Some matrix protein is shown travelling to the nucleus. The nucleocapsid segments, which contain the viral genetic information, migrate to the nucleus. They move into the nucleus via nuclear pores (the flower like structures on the curved surface of the nucleus) and so deliver the viral genome to the nucleus (which contains the cell's own genetic material). INSIDE THE NUCLEUS: In the nucleus, the viral genetic material (-ve sense RNA) produces viral messenger RNAs of various kinds (vmRNA) which travel out through the nuclear pores. (Messenger RNA, or mRNA, carries the genetic information that is used to direct protein manufacture.) Some vmRNA directs the synthesis of nucleoprotein (green dots) that travel back into the nucleus. Other vmRNA directs the production of matrix protein (purple dots) shown emerging from a viral polyribosome (several ribosomes strung together along a length of viral mRNA) in the middle of the picture. Some matrix protein travels to the nucleus and some collects beneath the cell membrane. Other vmRNAs direct the production of external (transmembrane) viral proteins. The manufacture of such "external" proteins follows a different route. Production starts in the rough endoplasmic reticulum and progresses through the Golgi apparatus. The haemagglutinin (red) is shown progressing through the Golgi at lower left, finally being discharged onto the cell surface from a vesicle (the sphere containing red dots that is delivering its contents onto the cell surface through a hole). The neuraminidase (yellow) is shown (for clarity) going through the Golgi in parallel but above the haemagglutinin. NEW VIRAL RNA SEGMENTS: In the nucleus, the viral -ve sense genome also produces +ve sense copies of itself. These are then used to create further copies of the viral genome. These new -ve sense viral genomic RNAs become associated with nucleoproteins and some matrix proteins that have migrated into the nucleus. Such newly formed nucleocapsids and their associated M proteins exit the nucleus via nuclear pores (BLUE and ORANGE segments can be seen streaming across the cell). VIRAL ASSEMBLY AT CELL SURFACE: Just beneath the cell surface, these individual BLUE and ORANGE ribonucleoprotein segments are shown associating together to form the helical nucleocapsid (the BLUE and ORANGE barrel-like structure). Around the new nucleocapsid, the matrix proteins are shown collected beneath the cell membrane (the haze of purple particles marked), while above the cell membrane, haemagglutinin and neuraminidase have coated the surface. With all these viral elements now in place, the newly forming virus particle (which contains segments derived from both the BLUE and ORANGE strains) can begin to take shape and to bud from the cell surface. The cell membrane that envelopes the emerging nucleocapsid and matrix protein becomes the viral envelope (complete with projecting spikes) and the virus particle is released. The new virus particle is now ready to infect another cell. Because it contains a new mix of genes, this reassortant can pose serious dangers. This dramatic change in the genotype is called antigenic shift to distinguish it from the more minor changes that occur due to mutation or poor fidelity RNA copying, which are called antigenic drift.